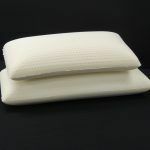 This pillow is made of a sterile, hygienic material that does not require washing. It can be spot cleaned with warm water and mild soap. Rinse with warm water and dry thoroughly at room temperature away from heat and light. Never place in a machine washer or dryer. The zippered cover can be removed and washed in the washing machine with similar color items using warm water and mild detergent. Tumble dry using low heat.